Highlights from the opening round of the Turkish Airlines Open at Regnum Carya Golf Resort. Justin Rose made a bogey-free start to his bid for back-to-back Turkish Airlines Open titles to get within a shot of the early lead in Antalya. Rose, who can move to world No 1 with a victory this week, mixed four birdies with an eagle to post a six-under 65 at Regnum Carya Golf Resort, where Paul Dunne set the opening-round pace. Dunne birdie three of his first five holes on his way to a blemish-free 64, while Padraig Harrington and Thorbjorn Olesen - who also didn't drop a shot - join Rose in a share of second. "The holes I needed to hit a good shot on, I stepped up and hit a really straight one and that's what I was really pleased with," Dunne said. "I left a few putts short out there but I think we can always say that." 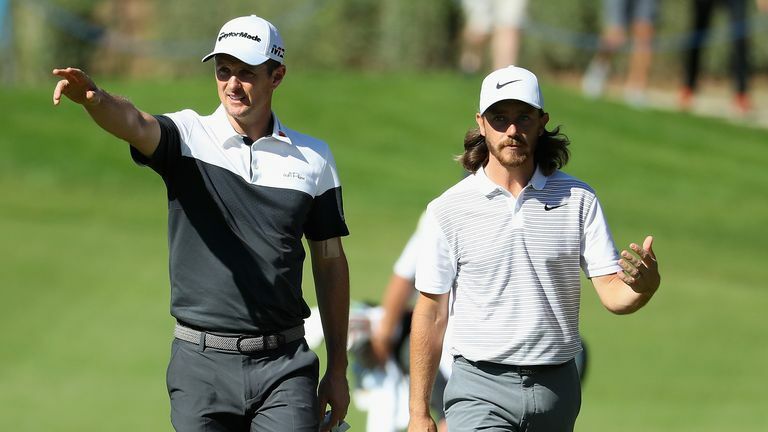 Playing alongside Tommy Fleetwood and Thorbjorn Olesen, Rose opened with three straight pars before holing out from the semi-rough for an eagle-two at the par-four fourth. Rose drained a 20-footer at the next and added another from close range at the par-three eighth to reach the turn in 30, before posting a two-putt gain at the 15th and closing his blemish-free card by holing a six-foot birdie at the 18th. Beginning on the 11th hole, Dunne birdied five of his first nine holes and moved in to the outright lead with a seven-foot gain on the seventh, before holing a long-range effort at the 10th to set the clubhouse target. Harrington opened with three straight birdies and posted back-to-back gains from the 12th to get to six under and threaten the lead, but missed a six-foot attempt at the 15th and a putt from the halve the distance at the last. Olesen posted six birdies in scoring-friendly conditions, while Lee Westwood and Haotong Li are part of the group of seven players sharing sixth spot on five under. A final-hole birdie closed a bogey-free 67 for Matt Wallace - a three-time winner on the European Tour this season - as Tommy Fleetwood, would close to within 41,000 points of Ryder Cup partner Francesco Molinari at the top of the Race to Dubai with a victory, opened with a three-under 68. Watch the Turkish Airlines Open throughout the week on Sky Sports. Live coverage continues on Friday from 9am on Sky Sports Golf and Sky Sports Main Event.